As a game journalist I tend to receive a fair amount of swag. These aren’t trinkets I request, but nevertheless seem to accompany game review copies. Sometimes, though, they come on their own. Last week, for instance, I received a “Hulkamania” bandanna with a fact sheet to promote WWE Legends of Wrestling. (The game, I guess, comes later). About a decade ago the level of swag was ridiculous. Almost every day I would received 2-3 Hanes XL Beefy-Ts plastered with a game logo in either black or white. The shirts were invariably too large for me to wear, so I ended up giving them away, packing them up, or, in some cases, using them as cleaning rags. (My apologies if I used your game’s shirt for this purpose). Lately, perhaps because of the faltering economy, the flow of swag has slowed down. Hanes must be pissed. In the universe of swag, the smartest game company is Rockstar Games. Take, for example, my review copy of Grand Theft Auto: Chinatown Wars. It arrived the other day and yes, it arrived with a t-shirt. The good news: It was a Medium, which I can actually wear. 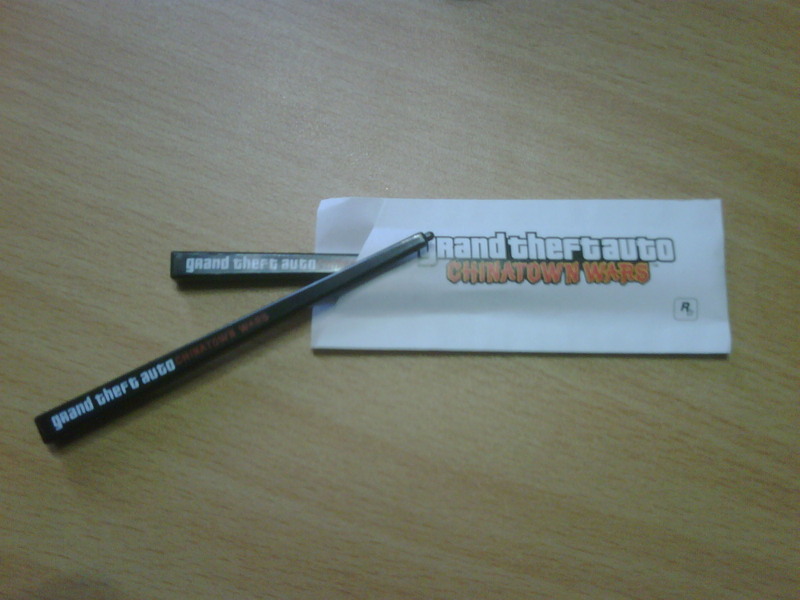 But I’ve saved the coolest swag for last: GTA Chinatown Wars mini-chopsticks, which double as a stylus for the DS. For mini-chopsticks they are, if I do say so myself, immacuately constructed. 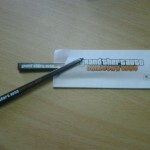 They feature the GTA logo along the side, and even a Rockstar logo on the top. And they come in an authentic paper chopstick carrying case. Yes, perhaps I am obsessed with them. But after a couple decades of bad swag, the good stuff inspires me.